I first saw Jacques Henri Lartigue's photographs when Janet and I were visiting Paris in August 1986. We passed a museum showing his work, went in, and saw what some people call Lartigue's greatest work--his stereo photographs. Janet and I looked through viewfinders at stations where doubles of each image were mounted. Adjusting our eyes and viewfinders, the photographic landscapes and portraits merged into three-dimensional worlds. 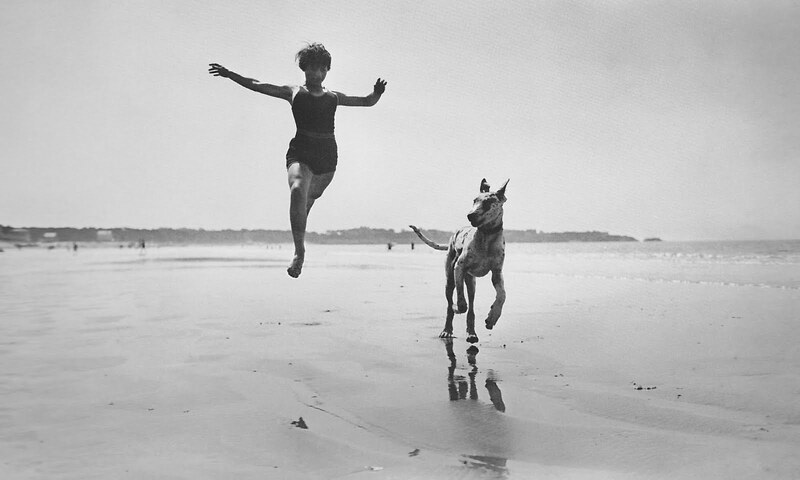 Lartigue (June 13, 1894--September 12, 1986), a French photographer and painter, grew up in a family of wealth. 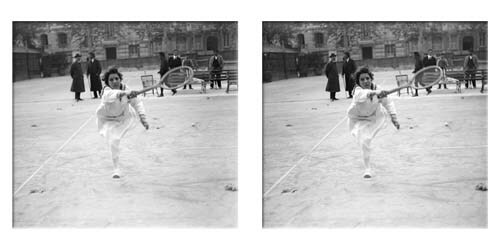 It permitted him and his siblings to make the world a playhouse of games, and for Lartigue it was a game of photography that he mastered young. He was 11 when he took the picture of the "ghost," above, the same age when he took his surprising photograph of Bichonnade, at the bottom of the page. Critics wonder how a boy so young could capture a woman in mid-flight so perfectly with the earliest of camera equipment. Lartigue's world is spontaneous, many have said, and we found it vivid, as well, and the stereoscopes made it even more so. A dirigible lumbers above a crowd, we see at the top of this post. A tennis player charges at us, above. And we take another look at Bichonnade, suspended above the stairs. 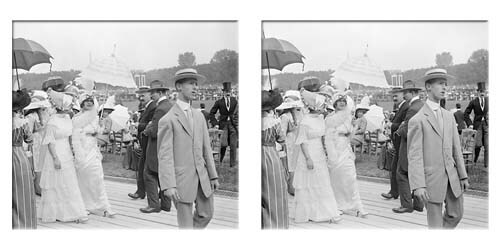 Over the the next years I would see Lartigue's photographs, mostly single images, in hardback books and on museum walls, and I would do my own kind of stereoscope, a double-take, going back to a page I had just turned, returning to a gallery I had just left. There was the rabbit rocketing in a homemade racer; the terrier soaring over a stream, launched by its master, a moustached man in a bowler hat; the car with the big fat tires speeding--was it going over 35 miles per hour?--while standing viewers appear blown away by the excitement. Recuperating from all this activity is the man in the floating device. We see him now at the very top of Custom Fit Freeway. 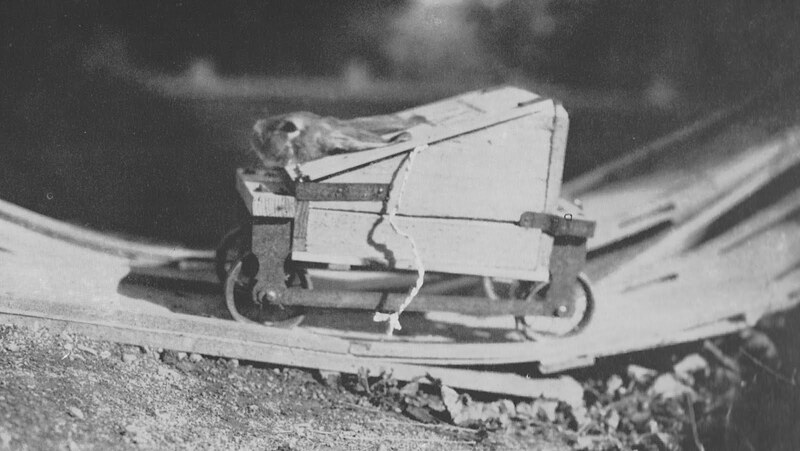 It is Zissou, the nickname for Lartigue's older brother Maurice, in his tire boat, looking at ease. The photograph was taken at the family home at Rouzat, in 1911, and the Lartigue brothers make us wonder: shouldn't we all have our own tire-boat? It is, come to think of it, the perfect accessory to a suit and vest. 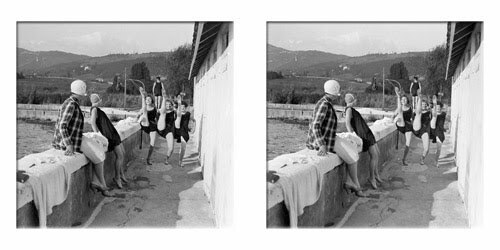 When I looked at Lartigue's photographs for the first time, I did not know that he had taken many of them before he had reached his teens, or that he was limited by a cumbersome plate glass camera. I only knew that his photographs were seductive and asked, "Why not?" and did not wait for an answer. I had the same feeling when walking in Paris in its light rain earlier in that August day with Janet. It didn't matter where we went; we were there, in Paris. We saw an old museum, its gray stone walls and grand steps. In New York these same steps might seem daunting and its walls forboding, causing hesitiation; in Paris before such a building there was nothing to decide. We said, let's do it. Let's go. We folded our shared umbrella. It was not about getting out of the weather, but getting into something that must be done right then and there. That's all we knew. We entered a great hall, then found the exhibition, in a much smaller room, and we were alone, and our optimism was encouraged, really, by that little fact that our company would not be shared with anyone else. We didn't know what we were getting into, but why should we? The room--a better word than gallery, in this instance--was intimate, and it was quiet, as it should be. Then we met Lartigue, by way of his photographs. They were set, two by two, with wood and brass supports working together to hold them in honor. 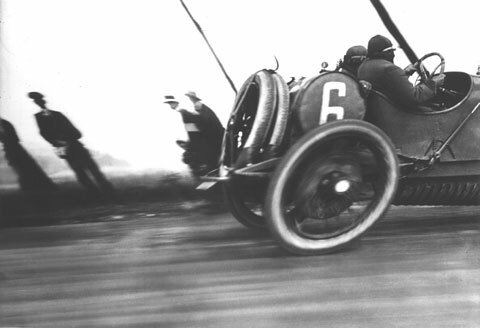 He only took a picture, Lartigue said, and this appears to be true, if it made him happy. 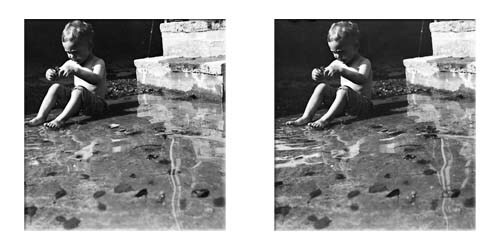 We had been happy in the Paris rain and happier to go back into it after seeing Lartigue's men and women leaping, flying, diving, running, swimming. The family pets had joined in too. And there were more children. Jumping. Twirling. Dancing. We had done all of these same things once, twice, three times and more, before we stopped counting years ago. Now it was our turn to walk back through those museum doors and out to the Paris streets, and this time we would be floating with no need for our umbrella. We did not care if we got wet. More information about Jacques Henri Lartigue can be found at Donation Jacques Henri Lartigue, and there is a video of the BBC documentary on Lartigue on Google and YouTube.